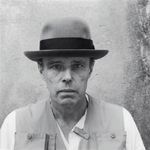 JOSEPH BEUYS was born in 1921 in Krefeld, Germany. Conscripted into the army, he suffered injuries from several plane crashes. After a period in an English prison camp at the end of the War, he began to study natural science, but disillusioned with its basic tenets he switched to art. From 1947 to 1951 he studied at the Düsseldorf Art Academy with the sculptor Edward Mataré. At that time he encountered Rudolf Steiner's work. After years of struggling as an artist and times of deep depression, in 1961 Beuys became Professor of Monumental Sculpture at the Düsseldorf Academy, from which he was expelled in 1972 for challenging the quota system by taking on all students who wanted to learn. During this period he worked with groups like Fluxus whose experimental, interventionist 'events' had much in common with his own strategies and concerns. This lead, from 1965, to Fluxus-festivals and 'happenings', and life-long collaborations with artists like Nam June Paik. Following his first gallery 'action' (a term he coined) in 1965, 'Teaching Paintings to a Dead Hare', Beuys' international reputation grew. He became known for his largely silent actions with substances, creatures and instruments of all kinds, and provocative formulations like 'Every Human being is an Artist' and 'Art=Capital'. He participated in many major international events, including the Venice Biennale, Edinburgh Festival and five Documenta exhibitions from 1964. In 1979 he was honoured with a major retrospective at the Guggenheim Museum, New York. In the '80s there were more exhibitions of Beuys' work than of any other artist, and his influence on younger generations of artists has been extensive. Beuys - alchemist, social visionary and artist - died in 1986, just after receiving the prestigious Lehmbruck Prize. He left behind him not only numerous large-scale installations and site-works, hundreds of provocative multiples and small objects, thousands of drawings (many on blackboards developed as part of 'permanent conference' / dialogue actions), documented social sculpture forums about energy, new money forms and direct democracy, but above all a methodology, 'theory of sculpture', and ideas like 'parallel process' and 'social sculpture'. These ideas - underlying his major social process works such as 'Organisation for Direct Democracy', '7000 Oaks', the 'Free International University' and the 'Honey Pump at the Workplace' - contain unexplored seeds and are a profound basis for new generations of ecological, social process and interdisciplinary practitioners. add to basket WHAT IS ART? add to basket WHAT IS MONEY?